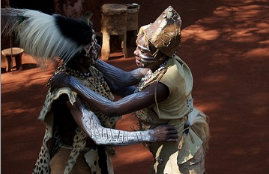 Africa has some amazing African festivals of 2013 that will take place throughout the year. Make the most of your African adventure by planning to be at one of these festivals either before or after your overland trip. Ethiopia’s largest festival is celebrated with music, food and processions. The Feast of Epiphany has origins from a thousand years ago. There’s plenty of opportunity to get involved in the festival; be prepared to let all your inhibitions go and join in some very vigorous dancing. If possible, book a guide to go with you, so that they can explain what’s happening during the ceremonies. Some of the best towns to see this African festival are Addis Ababa, Lalibela and Gondar. The Panafrican Film and TV Festival of Ougaadougou (FESPACO) is a visual feast that has been running for more than 40 years. It’s held every two years in the capital of Burkina Faso. There are 11 cinema halls across Ougagdougou, where the screenings are held, and the glitz is reserved purely for the opening and closing ceremonies. There’s a best film prize and recipients are awarded the Golden Yennenga Stallion – the FESPACO version of the Oscarstatuette. Since the Cape Town Jazz Festival began in 2000, this event has grown year by year. It’s now a huge international event, otherwise known as Africa’s Grandest Gathering, and the two-night festival features more than 40 African and international artists. The venue is the Cape Town International Convention Center and if you’re in Cape Town during early April, it’s definitely worth getting some tickets. If you’re looking for urban African festivals for 2013 – don’t miss this one. 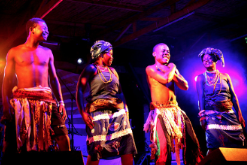 The International Festival of Arts in Harare pulls in performers from around the world. It’s one of the most vibrant cultural festivals in Africa, with music, plays, spoken word and much more. This annual festival is an unqualified success every year. The Lake of the Stars Festival is going to be a cultural explosion in 2013. The 2012 event was canceled in order to fund local initiatives, but it’s back and ready to rock your soul. This music festival gathers artists and performers from all over Malawi and from other parts of the world every year. It began in 2004 and is held on the shores of Lake Malawi. A broad range of music is performed, including reggae, folk and afro-pop. As well as raising money for local charities, the Lake of the Stars Festival drives tourism to Malawi. Why? The Lake of the Stars Festival is an African music culture experience not to be missed. Tay Grin’s Dancers at the Lake of the Stars Festival. Photo by Maria Thundu. Otherwise known as the Festival of the Exodus, this is the commemoration by the Anlo Ewes people – an ethnic group in east Ghana – who, legend has it, escaped from a tyrannical ruler Notsie, Ago-Koli, by walking backwards. This festival has many ceremonies attached to it, including a peace-making session to resolve all outstanding issues, a purification ceremony where all the villages are swept clean and all rubbish is burnt. The cleaning ceremony starts at the Volta Estuary and continues until the Mono River in the Republic of Benin is reached, days later. Village chiefs dress in their finest regalia and receive homage from their subjects during a formal gathering. The biggest gatherings take place in Anloga (15 km from Keta) on the first Saturday of November. During the month of November, the cultural carnival in Mombasa is a great festival to spend time at. You’ll get the chance to see many traditional tribal costumes in a parade down the main avenue of Mombasa, and there are musicians from all over Kenya who take part. This six day event aims to provide space for peace and integration of different East African communities. Many different communities show off their individual cultures here, and you can see arts and crafts on sale at stalls throughout the city, as well as watch traditional Kenyan dances. A sailing regatta on the seafront is also part of the festivities. Anyone who enjoys a beer will get a lot out of the Cape Town Festival of Beer. You’ll find great quality beers from the big brewers as well as home brewers and micro-breweries. There are plenty of samples to be had, as well as demonstrations to watch on different techniques behind brewing beer. Apart from everything to do with beer being on display, a bucket full of live entertainment and great food is available to enjoy too. Now all that’s left to do is pick your overland adventure tour and plan your travel dates to carefully align with whichever African festivals 2013 is drawing you towards. Lorena Benchis is an amateur photographer with a passion for travelling. She works as a freelancer which allows her to travel more than your average Joe. Her aim is to give readers the latest travel tips and reviews of the best destinations for family holidays. Three days of traditional Touareg art, music and dance takes place in Essakane, 2 hours from Timbuktu, Mali. International acts from Europe and West Africa round out the festivities. Everyone camps in the desert with their camels close at hand. A truly unique cultural event that is well worth the trek. It's worth taking a tour, in the past few years there have been some safety concerns. In 2013 the organizers are doing their best to find a safe spot in the Sahara to hold the festival. Check the official web site for updates. Fes Festival of World Sacred Music, Morocco This wonderful spiritual festival, held annually in Fes, allows you to bump into whirling dervishes from Iran as well as mystics, chanters and dancers from all around the world. A festival celebrating the local culture of Fes is held concurrently. Both festivals allow visitors a wonderful insight into traditional life in the old walled city. Sip some mint tea, enjoy sufi chanting and of course all that delicious Moroccan food. A music festival based on the traditions of Gnawa music has grown to include musicians from all over the world. This successful annual festival has been around for a decade and venues are dotted all around the picturesque town of Essaouira. Here's a tour if you would like to join in the fun as a group. Gnawa music is a combination of acrobatic dancing as well as music. Its origins lie in a unique mixture of Berber, African and Arabic songs, religious rites and dance. This festival is East Africa's premier cultural event and it takes place annually on the historic island of Zanzibar. You can enjoy music, arts, literature, film and more, from all over Africa and countries bordering the Indian ocean. Dhow races take place throughout the festival. An excellent tour is available through Zanzibar Festival Tours based out of London. They're offering a 10 night package, front row seats to all the events, and first rate accommodation. On the edge of the Saharan desert, the Touareg and the Fulani nomads used to come together once a year for a week. They would dance, make music, men dress as women, women dress-up and they race their camels. The event was known as the 'Cure Salee' and was one of the most unique and colorful cultural happenings in the world. Today, the Wodaabe are staging a separate festival to avoid the tourists and commercialization that has been creeping into their celebrations. You can join a tour to enjoy the Gerewol. Check out this You Tube video of the festival. Attracting more than 50,000 people, this annual festival celebrating the culture of the Sahara desert is quite a spectacle. The festival takes place in the heart of the Tunisian Sahara in the small oasis town of Douz. Originally a bedouin marriage market, the festival is now a four day affair filled with singing, dancing, feasting and camel racing. There's an excellent craft fair and lots of time to mingle with nomads from the surrounding areas as well as French tourists. There are approximately 350 million Christians in Africa. Christmas is celebrated throughout the continent by Christian communities large and small. On Christmas day carols are sung from the Congo on down to South Africa. Meats are roasted, gifts are exchanged and family visits made. 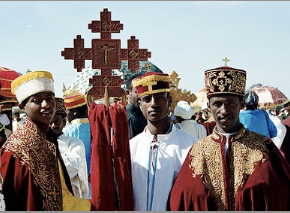 The Coptic Christians in Ethiopia and Egypt celebrate Christmas on the 7th of January (rather than the 25th of December) because they follow a different calendar. Rarely do we make a trip to Africa without being completely overwhelmed and enchanted by the music of each country we visit, and the talented entertainers we meet, whether it be at a lodge in the Serengeti, a world event in Accra, Ghana, an open air buffet in Arusha, Tanzania, or a charismatic church service in Kumasi. King Kiki, (left) Dar es Salaam's star performer is a prime example of Africa's abundant talent; we enjoyed his friendship for several days in that historic crossroads city on Tanzania's Indian Ocean Coast, and look forward to seeing and hearing him again soon. In the meantime, we have a selection of CDs to lift us up on those occasional down moments. The "Heart and Soul" of African Music will be at the top of our editorial menu for 2000. Watch for a variety of items to appear on this page. If you want to send us information on any established African entertainers or rising stars, send an E-Mail any time.